Another Poll showing more and less the same result. Acording to the published poll Party of Regions and the Communist will re-secure a majority in the Parliament with 242 and the opposition on 208 seats. The only likely change is the split within the Socialist Party/Peoples Self-Defence Party. New comer to the electoral statistics includes ‘For Ours!’ Verka Serdyuchka’s Bloc (VSB), Ukraine’s drag queen finalist in the 2007 Eurovision song contest, who is registering over 2% voter support. If ever you need move proof that Ukraine’s president, Viktor Yushchenko, is constitutionally out of control take another look at the recent admission that the president will need to issue a forth decree or is that fifth decree to try and bring his decrees and dismissal of Ukraine’s Parliament in line with Ukraine’s constitution. The President of Ukraine is to issue a fourth decree to try and bring his decrees in line with Ukraine’s Constitution. Rather then admit that the decree is to correct errors in the earlier decrees. The president’s supporters are trying to pass it off as an offical launch of the parliamentary campaign. Earlier Moroz had warned of the need for a further decree, something that the office of the president denied at the time. Ukraine, according to the office of the president, has been without a parliament since April 2 when the president issued his first decree. Amidst ongoing concern that the president’s decrees are unconstitutional the president was forced to issue a second decree the day after the constitutional court retired to consider its verdict. The office of the president was hoping that by cancelling his first decree and issuing a second decree that would also negate the ability of the constitutional court to rule on the presidents first decree as the president decree was no longer in force. It was when the constitutional court decided to push on and consider the second decree in light of the argument presented on hearing the first decree.that the president continued the real possibility that the Constitutional Court was about to declare the president’s actions unconstitutional. In order to prevent the Constitutional Court from ruling on the illegality of his decrees, which would have provided a clear definitive indication that the president was indeed out of control and also facilitated grounds for the president’s impeachment, the president illegally dismissed three constitutional court Judges (two have since resigned and a third judge won an appeal against the presidents dismissal). When the president issued his third decree in May, following agreement to hold elections in Autumn he stated at the time that there would be no further decrees replacing the third decree. The third decree was also challenged and a further appeal has been lodged in the Constitutional Court. You see Ukraine’s Constitution states that an election must be held within 60 days of the termination of authority of the parliament. For all intensive purposes the president has dismissed the parliament unconstitutionally and has set an election date beyond the 60 limitation. The on again off again dismissal. Article 82 of Ukraine’s Constitution was designed to ensure that Ukraine would not be without a parliament for no longer then 60 days let alone 6 months. In theory, If you subscribe to the view of the Office of Ukraine’s President, the president can unilaterally issue decrees then cancel them and issue another decree indefinitely. Ukraine’s constitution only empowers the president to dismiss Ukraine’s parliament under three circumstances outlined in Article 90 of Ukraine’s constitution (Extract below). None of the conditions outlined in the constitution currently apply which indicates that the president’s decrees are in fact unconstitutional. The only constitutional grounds which the president now relies on is Article 90 clause (3) following the recent resignation of over one-third of Ukraine’s elected members of parliament. Even then arguably clause three can only take effect 30 days after September 4 , the date scheduled for the commencement of Ukraine’s next regular parliamentary session (Article 83 of Ukraine’s Constitution). “The Verkhovna Rada of Ukraine works in sessions. This means that come September 4 the parliament will not be able to commence its next scheduled regular parliamentary session and thirty days on the president will then have the constitutional authority to dismiss the parliament and according to Article 90 hold fresh elections within 60 days from the date the president is constitutionally able to dismiss the parliament. May 22 – Constitutional Court to rule against President’s decrees. April 17 -Ministry of justice legal opinion on constitutionality of president’s authority to dismiss parliament. The authority of the Verkhovna Rada of Ukraine is terminated on the day of the opening of the first meeting of the Verkhovna Rada of Ukraine of a new convocation. (3) the Verkhovna Rada of Ukraine fails, within thirty days of a single regular session, to commence its plenary meetings. The early termination of powers of the Verkhovna Rada of Ukraine shall be decided by the President of Ukraine following relevant consultations with the Chairperson and Deputy Chairpersons of the Verkhovna Rada of Ukraine and with Chairpersons of Verkhovna Rada parliamentary factions. The authority of the Verkhovna Rada of Ukraine, that is elected at special elections conducted after the pre-term termination by the President of Ukraine of authority of the Verkhovna Rada of Ukraine of the previous convocation, shall not be terminated within one year from the day of its election. The authority of the Verkhovna Rada of Ukraine shall not be terminated during the last six months of the term of authority of the Verkhovna Rada of Ukraine or President of Ukraine. A recent interview, published today by Ukranews (Copy below) , with Ukrainian Constitutional Court Judge Stepan Havrsh has brought into question the professional independence and seriously compromised the independence of the Constitutional Court. Stepan Havrsh was a political appointment made by Ukraine’s President, Viktor Yushchenko following the presidents illegal dismissal of three constitutional Court judges on the eve of the Constitutional Courts ruling on the legality of the president’s own decrees. The interview raises a number of issues not the least being concerns about a member of the supreme court prejudging and discussing cases before the court outside the court itself. Stepan Havrsh has confirmed, what has clearly perceived as having been the real motive of the president inference in the functioning of the court, the court is to avoid considering the question of the legality of the presidents decree at all costs. Stepan Havrsh was reported as stating “I cannot imagine myself as the Constitutional Court in condition in which three political leaders signed a political/legal agreement on holding early elections, which also stipulates the constitutional basis for holding the elections… How the court can agree to consider such a petition under such conditions”. Obviously accoring to teh Presidents appointee Stepen Havrsh the political agreement between various political forces overrides due process and constitutional law in Ukraine. The president’s interference in the functioning of the court and the statement made by the president’s political appointee seriously undermines democracy and rule of law in Ukraine. It should also be noted that a court of appeal has ruled that the president’s actions in dismissing the three constitutional Court judges was illegal. Two of the judges have since tendered their resignation and one judge has been reinstated following the decision of the Kyiv appellant court. If confidence is to be restored in the Ukrainian legal system then the Court must make a definitive determination on the question as to under what authority and condition the president has to dismiss Ukraine’s democratically elected parliament. The President himself had made a request to the Constitutional Court seeking the Courts deliberations on the same question. For Stepan Havrsh to dismiss the request for review by the statutory number of members of parliament prior to the courts due consideration and determination only further adds to the disintegration of public confidence in the ability of the Court to act in fulfillment of its own constitutional duty. In the circumstances where the Constitutional Court is unable or unwilling to consider the question of legality of the president’s actions then it is more so incumbent of the European Venice commission to independently review constitutionality of the president’s actions. Failure to do so only compromises and undermines the independence of the Parliamentary Assemble Council of Europe. Stepan Havrysh, whom President Viktor Yushchenko recently appointed as a Constitutional Court judge, has expressed doubt that the Constitutional Court will consider the petition that 46 parliamentary deputies filed over the constitutionality of the presidential decree that scheduled early parliamentary elections for September 30. Havrysh was speaking to Ukrainian News. «I think that there are no prospects of the Constitutional Court considering this petition because it is presently on an annually recess. The court is not working,» Havrysh said. At the same time, Havrysh said that Constitutional Court judges could consider such a petition at an emergency session, which the court’s chief justice has the right to convene. «However, [an emergency session] will mean that the Constitutional Court is challenging the Ukrainian political stability. Moreover, I cannot imagine myself as the Constitutional Court in condition in which three political leaders signed a political/legal agreement on holding early elections, which also stipulates the constitutional basis for holding the elections… How the court can agree to consider such a petition under such conditions,» Havrysh said. According to him, 10 Constitutional Court judges also have the right to interrupt the court’s recess and convene such a session. However, Havrysh described such an option as highly improbable. «The reactionary counter-forces that exist within the [ruling] coalition are simply attempting to undermine stability in the country, not even to disrupt the elections but specifically to undermine stability in the country,» Havrysh said while commenting on the decision to file such a petition with the Constitutional Court. As Ukrainian News earlier reported, 46 parliamentary deputies have filed a petition in which they ask the Constitutional Court to consider the constitutionality of President Viktor Yushchenko’s June 5 decree that scheduled early parliamentary elections for September 30. On June 5, Yushchenko signed the decree No. 497/2007 that scheduled early parliamentary elections for September 30. The decree changed the date of the early parliamentary elections for the third time and re-worded the reason for the elections. He cancelled his previous two decrees, in connection with which parliamentary deputies also filed petitions with the Constitutional Court. All Constitutional Court judges, with the exception of Chief Justice Andrii Strizhak, are on vacation from July 16. Center for Sociological and Marketing Research SOCIUM conducted a survey called “Social and Political Problems in today’s Ukraine. Situation and prospects of development.” 12,690 respondents all over Ukraine were questioned. The respondents were asked to answer 38 questions. SOCIUM sent the results of the survey to REGNUM. Below, you can see information about social and political attitudes of the Ukrainian population. So, 55.4% assess negatively consequences of the Orange Revolution. 11.4% have the opposite view. 14.1% are more negative than positive about the outcomes of the Orange Revolution, 11.1% are neutral, 8% are more positive than negative about it. Answering the question whether financial position of a respondent has changed and how, 42% said nothing changed; 30.3% state their financial position worsened, 26.1% believe their life improved, 1.6% gave other answers. Alexander Moroz, Speaker of the Ukrainian Supreme Rada – 5.9% (16.5%; 17.8%; 31.9%; 27.9%). According to results of the survey, if the elections to the Supreme Rada were held next Sunday, 41.4% of voters would vote for the Regions Party, 14.7% for BYT, 11.8% for Our Ukraine Bloc, 7.5% for the Ukrainian Communist Party, 4.5% for the People’s Defense by Yuri Lutsenko, 1.8% for the Progressive Socialist Party, 1% for the People Bloc by Litvin, 0.7% for the Socialist Party. Other political forces received insignificant support. A host of stars line up to be elected I want to see Verka Serduchka in Parliament? Ukrainian 2007 Eurovision Song contest runner up, Verka Serduchka, has indicated s/he will run for Parliament. Much of the challenge laid down by Ukraine’s drag queen is more about media attention and publicity then it has to do with politics, policies, democracy or good governance. If anything Verka Serduchka, Ukraine’s infamous drag queen will provide some light entertainment if not seriously effect the outcome of Ukraine’s election and international standing. Verka Serduchka has yet to meet Ukraine’s strict requirements for party registration before s/he can nominate for the election. Some commentators say that Verka Serduchka may even attack more then 3% of the vote, if that is true then s/he will also elect 15 more people. Even if s/he does not reach the 3% threshold s/he will effect the overall outcome of the September 30 poll. 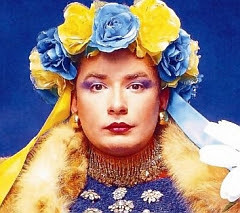 Votes supporting Verka Serduchka’s candidature have to come from somewhere and more likely then not they will come from the disillusioned youth sector, the first time voters or those that feel that participating in the election will not produce any meaningful change or outcome. Even if s/he does not obtain 3% of the vote required to get elected Verka Serduchka’s campaign will effect the outcome of the election. His nomination will increase the voter participation rate which in turn determines the extent of the 3% threshold barrier, making it that much more difficult for parties such as Lytvyn, the Socialist Party and Natalia Vitrenko from being elected. More reasons why Ukraine should seriously consider adopting a preferential voting system. It is early days yet and the full script is still in development. You are currently browsing the Ukraine Today blog archives for July, 2007.